With the help of the EclipseLink DBWS framework it is very simple to generate Web Services based on SQL statements, a table or a PL/SQL Procedure.without knowing or writing any java code. The only thing you need to do is to configure the dbws-builder xml and use this in the DBWS generator. The result of this generator can be a WAR archive, which you can deploy on a WebLogic Server. 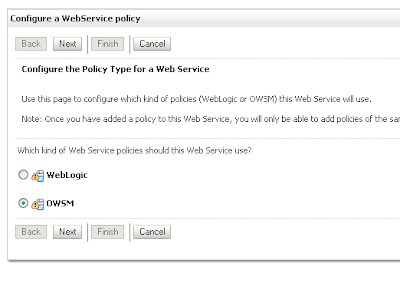 Because Eclipselink DBWS is part of EclipseLink you don't need to install any libraries on the WebLogic Server and after deployment you can test these Web Services in the WebLogic Console or add some OWSM or WLS WS Security policies. First you need to download EclipseLink and unpack the zip. Next step is to set the JAVA_HOME and provide the JDBC Drivers location. Go to the eclipselink\utils\dbws folder and edit the setenv.cmd or setenv.sh file. You can replace xxxxx with any 10.3.2 or 10.3.3 Middleware home or use a JDeveloper 11g R1 home. For this blogpost, I will use the emp and dept table of scott demo schema ( Part of the Oracle Database ) and use a PL/SQL package. Here is the code of the package, this packages contains two functions, the first returns the time in the required format and the second return all the departments in a ref cursor. Next step is to configure the dbws-builder xml file. ( Click here for more information about the dbws-builder xml ) The first properties part is necessary information for the DBWS generator. Off course you need to provide the JDBC Driver details. The dataSource property is for the JNDI name of the JDBC Datasource, this need to be created on the WebLogic Server. You can also use a SQL statement with or without any bind variables. Here is it handy to provide the simpleXMLFormatTag and xmlTag attributes. To expose a function in a package I can use this and because this will return all the departments, the isCollection attribute need to be true and here is it also good, to provide the simpleXMLFormatTag and xmlTag attributes. The last part of this dbws-builder xml is the emp table with inside a SQL statement. This is handy when you want to re-use the emp complex type. In this case I will also use the empType ( table name + Type ) in the SQL statement ( returnType attribute ). We are ready to generate some Web Services based on this dbws-builder xml. Go to the eclipselink\utils\dbws folder and start this in a cmd box. this will generate a war which can be deployed on WebLogic. you can also use -packageAs jdev or -packageAs eclipse. Then you can include this code in your JDeveloper or Eclipse project. Go to the Weblogic Console ( http://xxxx:7001/console ) and create the JDBC Datasource ( jdbc/scottDS ) and target this datasource to the right servers. 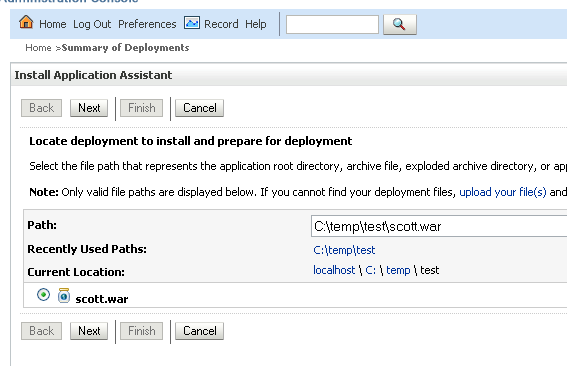 Go to deployments and click on install, Select your WAR. Click on the Test Client to test your WSDL operations. 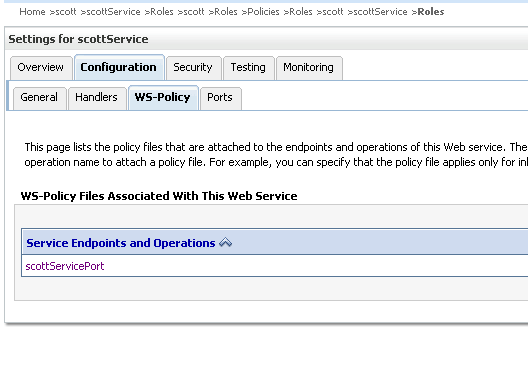 The last optional step is to configure the security on these web services. 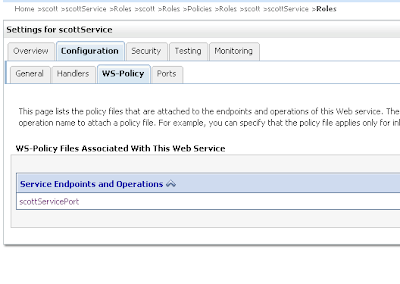 Go to the Configuration / WS-Policy Tab and select the endpoint. 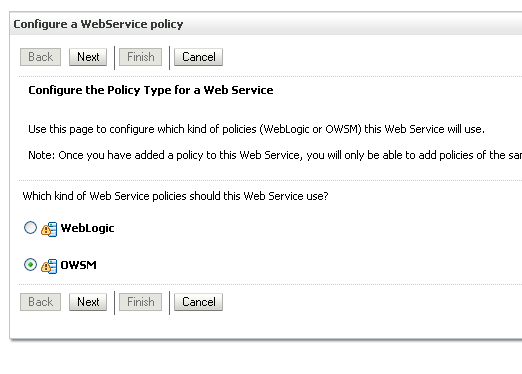 You can choose for the WS security policies of OWSM or those of Weblogic. 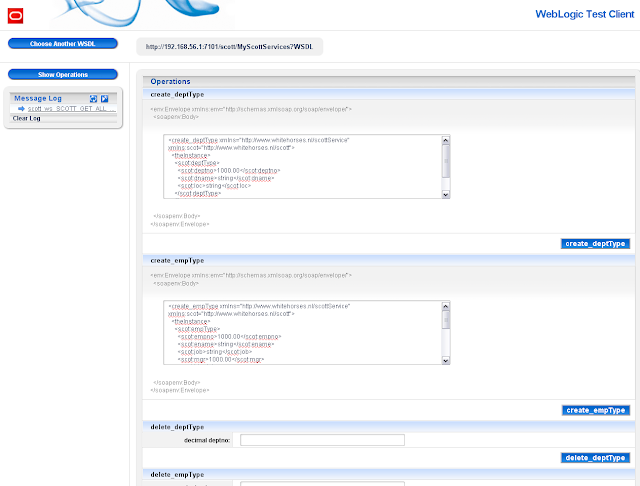 To configure OWSM for this Web Service you can use this blogpost. First of all, thanks for an excellent blog. It's basically a native way of exposing data and procedures without any code. And when coupled with OSB it really makes securely publishing legacy procedures as services a really simple trick. 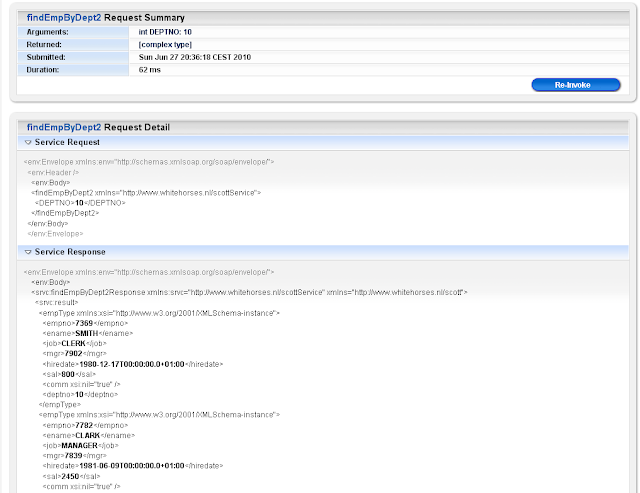 I know this XDB feature and I am using it for rest web services in combination with OSB. +ve of my solution is database independed, no licensing ( don't need to have WLS or Ora DB) and you don't need to know OSB. 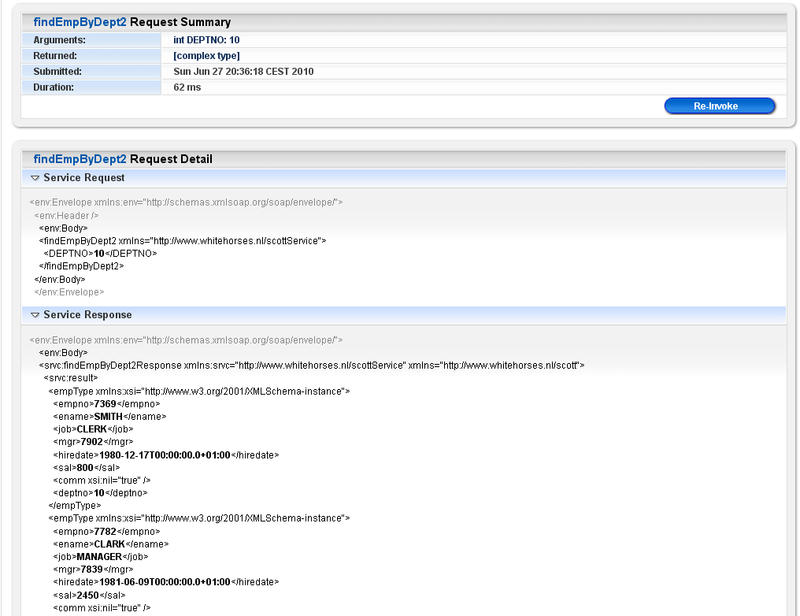 I think Oracle customer will use Soa Suite or OSB with the DB /EJB adapter. Do you know if you can use DBWS as a REST service as well? I dont thinks so , this is a DB to WS framework. I think it is 10.3.3 (ps3) or 10.3.2. Do you get a particular error message. you can try to download the latest eclipselink and update these jars in weblogic. No matter what I try. Though I have tried it with 10.3.0 and JBoss 5.1.0 only so far. First of you I want to thank you for such a wonderful blog. I have tested for a function which is having four input parameters. is not provided and invoked. How can I control the type and number of input parameters to handle this situation. For reference below is the xsd generated. Can I get more information from some source to fine control all this? I think I didn't get your point. In which file I need to update the nill attribute of the param tag ? Can't I generate the same during running the command line utility? I mean in the tool which send the soap request like soapui , when you got an element and this element is optIonal you need to provide it with nill is true instead of removing it . Thank you. I was using weblogic webservice test client to invoke the web Service.So there is no way the the xsd can be generated with minOccurs,maxOccurs param for a certain parameter? Also I faced a problem while executing in different network. At my home network the webservice worked well but it failed at my office network. But now i have an error when a stored procedure has oracle types for variable. oh oracle types must be mapped to something else ( need a wrapper I think ) and you need oracle toplink for this ( no dbws). What is possible, use eclipselink with PLSQL / ORacle object record types, plsql tables etc but not with DBWS, You need to program it. It should also work on other JEE servers, probably you are missing eclipselink jars or a jdbc driver. Can you try Tomcat EE or Glassfish.